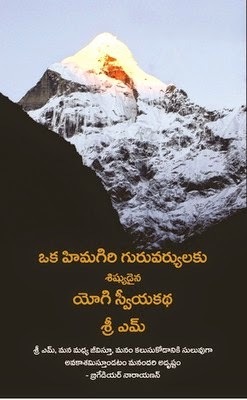 This is the Telugu version of Apprenticed to a Himalayan Master: A Yogi's Autobiography, by Sri M, the Indian yogi. Born as Mumtaz Ali Khan in Kerala, Sir M, also known as Sri Madhukarnath ji, left home when he was nineteen. He was keen on seeking answers to his spiritual questions. It was during this quest that he met his master, Maheshwarnath Babaji, with whom he lived in the Himalayas for more than three years. Sri M has now travelled across the globe for spiritual teachings and discourses. He has a deep knowledge of the Upanishads and other major Hindu philosophies. He has also founded The Satsang Foundation, which is an altruistic institution that mainly encourages value in education. Sri M, the Indian yogi and spiritual master, was born in Kerala. He is the founder of The Satsang Foundation. He has also authored the title, Jewel in the Lotus: Deeper Aspects of Hinduism. Many of his talks are available as audio CDs. Some of them are Collected Talks and Akshara Brahma Yoga.